Monday afternoon I made the mistake of composing a to-do list. Seeing the list prompted a full-blown anxiety attack. I had no appetite, felt very sick every time I forced food down my throat, and walked around mumbling weird things to myself for about 48 hours. Apparently this was not outwardly apparent, as my advisor said I seemed nonplussed about my impending dissertation defense. I was plussed, alright. But today was better. I've accomplished almost every thing on my list (or decided that it didn't really need to be done), and my appetite came back. I still couldn't dedicate much time to dinner, though, so I thought it was the perfect time to pull out Lorna Sass's Whole Grains for Busy People. I just wanted something to fill me up, but this dish (adapted from her beef ragu recipe) blew my mind. The pasta/turkey/tomato mixture was good alone, but the feta and lemon zest on top made it phenomenal. But the best part is that you cook the pasta in the sauce, so you only get one pan dirty. It was perfect for tonight. Heat oil over medium heat in a large saute pan, add onion, and saute until tender. Add garlic, cook for an additional minute, and then stir in turkey, thyme, and rosemary. Break turkey up, and cook until it's no longer pink, stirring frequently. Then add tomato paste and cook for another minute, stirring well. Pour in wine, and once it evaporates (a minute or two later), add water, tomatoes, and salt. Bring to a boil over high heat, add pasta, and let cook on medium high for 5 min. Then stir in zucchini and continue to cook until pasta and zucchini are tender and sauce is thick (about 10 min), stirring frequently. 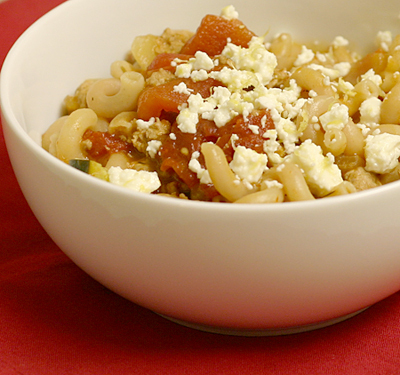 In a small bowl, combine feta and lemon zest, and sprinkle it over the ragu. Serves 6. Am I the only one with kitchen utensil fears? I'm not scared to go near my knives (even though they've done some damage to my fingers and I try not to sharpen them too often), but mandolines terrify me. They have a bad reputation, and one of my friends managed to almost completely cut off part of her finger a few years ago on one (the almost-removed finger part was lovingly known as "the flap"). But sometimes mandolines make life a lot easier. Sure, it's possible to julienne things by hand, but who really wants to do that at the end of a busy day? So for this dish I held my breath, maintained complete concentration, and went to town with the scary piece of plastic and blades. All of my fingers are intact, so I consider it a success. It was a bigger success when I tasted this dish. I usually cook zucchini until it's falling to pieces (it's the southerner in me), but I liked this barely cooked, still crunchy version. It tastes like a completely different vegetable, and I'm always up for something new and different. I liked the almonds in it, as well, even though I almost burned them. But best of all, it takes no time. In fact, I spent far more time giving myself a pep talk to use the mandoline than actually preparing the dish. So if you don't have weird problems like I do, it will come together in less than 10 minutes. 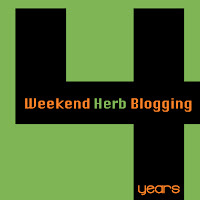 I'm submitting this dish to Weekend Herb Blogging, which is organized by Haalo from Cook (almost) Anything At Least Once, and hosted by Graziana from Erbe in Cucina. Heat oil in a large saute pan over medium heat. Add almonds and saute, stirring frequently, just until they begin to turn brown. 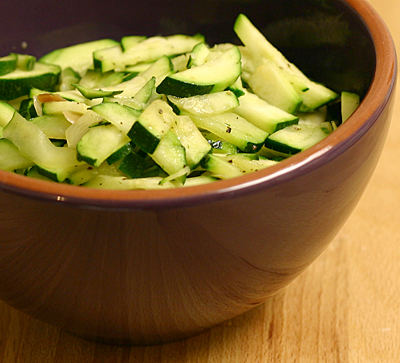 Add zucchini, crank heat up to medium high, and cook for a few minutes, stirring constantly, just until zucchini is hot but still crunchy. Season with salt and pepper. Serves 3. Before I get to this stew, you may have noticed a new navigation bar in the header. 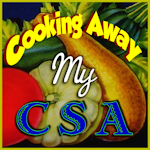 I added a complete recipe index organized by category, which I'm hoping will help everyone (including me) find recipes, and also a list of my quick/easy and crock pot recipes. I've intended to make these changes for a few months now, but I finally had time to sit down to do it (and it was a good distraction to keep me from thinking about the fact that my dissertation defense is in 10 days - yikes!). Let me know if you have any suggestions for other ways to improve the navigation of my site (I'm open to anything!). Now to the recipe! First off, I'm naturally drawn to any recipe that includes turmeric. Despite the fact that it has permanently dyed many of my kitchen utensils yellow, I can't get enough of it. I've always had an unusual obsession with mustard, and I'm finally realizing that it's the turmeric that I love so much. 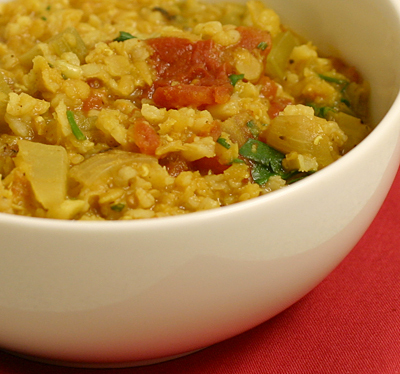 I also love red lentils, and they always seem to make meals amazing. So, Kalyn had my attention as soon as she posted this recipe, and I'm sad that it took me so long to make it. It turns out that I didn't have enough lentils, so I threw in some cooked brown rice and I loved the combination. Next time I'm doubling the recipe so that I can stock my freezer (if I don't eat it all). I'm submitting this to My Legume Love Affair, which is hosted by Manju at Mirch Masala this month, and is organized by Susan at The Well-Seasoned Cook. Combine lentils and 1 1/2 cups water in a small saucepan and bring to a boil. Then cover the pot, remove it from the heat, and let it sit for 20 minutes. While lentils are sitting, heat oil in a medium saucepan over medium heat, and saute onion and celery until tender. Then add garlic and cook another minute. Stir in turmeric, cumin, and chili powder and cook one more minute. Add tomatoes, brown rice, remaining 2 cups water, and lentils, and stir well. Bring this to a boil, reduce heat, and simmer until lentils are tender (20-30 min), stirring occasionally. Season with salt and pepper and add lime juice and cilantro. Serves 4. Lately my celebrations for all holidays have been a bit late. I had great plans to make colcannon (mashed potatoes with either cabbage or kale) for a St. Patty's day potluck, but I ended up working on my dissertation for most of the night. Already armed with all of the ingredients, I decided to make it the next night. And now the same thing has happened with my Persian new year celebration (luckily this time a party got in the way, not my dissertation). Oh well, it's still fun to try new dishes, even if it is on the wrong day. I love mashed potatoes, and this was a great variation. 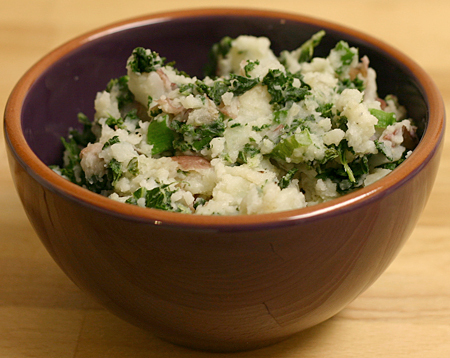 Most of the colcannon recipes I see use cabbage, but I decided to make my version with kale because I hadn't had kale in a while. Given that the texture and taste of cabbage and kale are so different, I imagine that a cabbage version tastes like a completely new dish, but I bet that it would be equally delicious. It took me a few bites to get used to the interesting mix of textures, but I soon adjusted and thoroughly enjoyed it. Bring a large pot of salted water to a boil, add kale leaves, and let boil until kale is very tender (about 10 min). Drain kale, let cool, and then chop it into small pieces. Next, place the potatoes in the pot, cover with water, add salt, and bring the water to a boil. Let simmer until potatoes are tender (15-20 min). Drain potatoes and return them to the pot. Add butter and warm milk and mash well with a potato masher or ricer. You may need more milk if your potatoes aren't creamy enough with 3/4 cup. Then stir in kale and onions and season with salt and pepper. Serves 6. I've been wanting to try this recipe for months now, but weird food allergies, several trips, and finishing my dissertation kept me out of the kitchen. It was worth the wait, though. This is a recipe from my Adopt-a-Blogger adoptee, Anne at My Cooking Myself. Anne recently moved her blog to blogger, so even if you've been to her blog before, go visit again because it's looking great! I changed a few things about the recipe (I didn't use a jalapeno because I didn't have one, and baked the chicken instead of grilling it), but the flavors were fantastic. This was also some of the juiciest chicken I've ever had. I don't typically eat a lot of plain meat (not incorporated into a dish with other things), but I'm glad I made an exception for this recipe. Thanks, Anne! Combine the first seven ingredients in a large bowl, and then add chicken. Cover and refrigerate for 8-24 hours, turning once if chicken isn't completely covered. 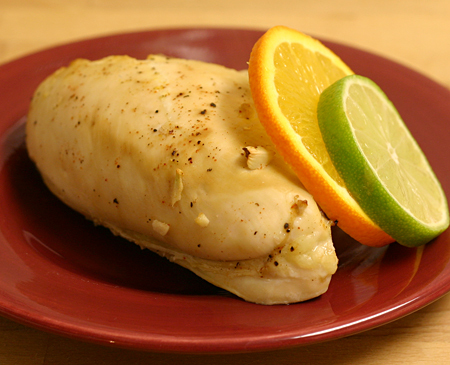 Remove chicken from marinade and place in a small baking dish. Cover dish with foil and bake at 375 for 30 minutes. Then remove foil and continue to bake until chicken is done (I used huge pieces of chicken and it took another 20 min). Serves 4. I really appreciate all of the feedback on my post about saving time cooking. I'll continue my mini-series with a post about saving money. I don't know that I'm the right person to write this because I make food a priority in my life and spend a lot more money than I need to because I often choose high quality foods and enjoy trying new and exotic ingredients. That being said, I do have many ways that I save money within that framework, so I'll share those. Unfortunately there's often a give and take between money and time, but my advice is to find a happy medium and be flexible (I spend more money when I'm busiest, and then spend more time cooking when I have it). I also try to stock my freezer with leftovers so that I always have food ready to go when I have a hectic schedule, and am not tempted to buy expensive prepared meals. Again, I would love to hear what you do to save money! 1) I make a lot of things from scratch. When I started making my own bread about 18 months ago, I calculated the amount I was spending on homemade vs. store bought bread. I can't remember the exact figures, but it cost about 8 times more to buy the equivalent kind of bread (at the time I was eating 100% whole wheat without HFCS or preservatives). Gluten-free flours are expensive, but over time it sure beats the $6 tiny loaf that tastes like cardboard. Making pasta, cheese (ricotta is simple), pickles, and other ingredients will save you tons of money. 2) I take advantage of cheap sources of protein. Dried beans and peas are dirt cheap, and it's easy to cook up a big batch and freeze them (here's a great post about ways to cook and eat dried beans at Cookthink). Eggs are also cheap (and fast!). Grains can be a great source of protein, too, especially if you choose grains like amaranth and quinoa. I'm very picky about my meat (I try to buy only local meat from farmers that I know), so it's usually fairly expensive and I eat less of it. 3) I buy lots of things from bulk bins (grains, beans, nuts, dried fruit, spices, etc.). Bulk items are usually cheaper, and it's also the perfect option if you only want a small amount of something. Most natural foods stores and some chain grocery stores have bulk bins, so check them out! 4) I make sure to eat everything that I buy before it spoils. I can't stand to let things go bad, so sometimes I have odd meals that combine whatever needs to be used. Sometimes these are the most satisfying meals that I make, and they often find their way onto the blog. Planning meals at the beginning of the week helps, and I plan meals with ingredients that spoil quickly for the nights right after my shopping trip. 5) I've become an advocate for buying local food, and I've found that it often saves me a lot of money. There are HUGE exceptions to this statement (like meat and milk), but in the summer the produce is generally cheaper at my farmers' market than it is across the street at the grocery store. And if you assign taste a value, we're talking extreme savings on almost all local foods. If you buy produce in season and freeze it, you can really save big throughout the year. 6) I savor my splurge purchases. If I buy parmigiano reggiano or another high quality (and expensive) ingredient, I only use a little bit at once. Often that's all I need to be very satisfied, and I get more out of my purchase. I don't use expensive ingredients if the taste will be covered up by other strong flavors in a recipe. 7) I mix my own spices/flours/etc. Spice and herb blends are often marked up a ridiculous amount, but it takes about 30 seconds to mix my own. The same goes with gluten-free flour mixes (but I realize that sometimes it's not worth buying a lot of a rarely-used ingredient). 8) I save a ton of money on breakfast. Back in the day, I bought a lot of cereal, and that gets expensive. Now, I eat a huge bowl of porridge (a mix of whatever grains I feel like throwing in my crock pot that week) almost every day, and it costs about 20 cents per meal. Plus, it tastes much better than anything I can buy, and cooks while I'm asleep. 9) It took me a while, but I've embraced eating naturally gluten-free foods. When I first realized that I had a problem with gluten, I spent a ton of money buying special things that came with a "gluten-free" label. I finally realized that I wasn't buying packaged food before, why did I need it now? I do keep a stock of gluten-free flours, starches, and gums, but otherwise I've gone back to almost exclusively eating non-processed foods that are naturally gluten free, like gluten-free grains, beans, meat, eggs, vegetables, and fruit. Now I spend about the same amount of money that I did before my gluten issues surfaced, and I couldn't be happier. The bottom line is that even when I'm buying expensive ingredients, it's still much cheaper (and almost always tastier) than eating out. Hopefully this will give a few ideas for those of you trying to eat healthy on a tight budget. This is a hot topic right now, so I'll also share a post that I noticed over at Dianasaur Dishes on the same topic. Diana's tips are similar to mine, but she also goes into more on saving money by planning meals and shopping trips. How do you save money while still eating healthy? It has been remarkably warm around here for the past couple of days (even up to 55 degrees today! ), and I couldn't be happier. I woke up and listened to the birds having a loud discussion, and as soon as I stepped foot outside, I couldn't help but smile and whistle on my walk to the lab. (This might also be due to the fact that it's spring break and campus is empty. Swarms of students still intimidate me.) But the remnants of winter still abound. There's an inch thick layer of ice surrounding my parking spot, so I have to get to the edge of the ice, dive for my car, and hold on with a death grip, pulling myself towards the door. It's only amusing because I haven't broken any bones yet. To keep myself warm for what I hope is the last of the winter, I made this soup last week. Well, it started out as a soup. Somehow between pouring my first bowl and packaging the leftovers, it kept cooking and most of the liquid evaporated, leaving me with a mushroom and rice pilaf. I loved both versions, so I'll include rough directions for both. I love wild rice for its nutty flavor and the crunch that it retains, and it was the perfect complement to the tender sauteed mushrooms. Heat oil over medium heat in a medium saucepan. Add mushrooms and saute until tender, and then stir in carrot and garlic and saute for another minute. Add basil, thyme, and salt and pepper, and stir well. Finally, add rice, stock, and water, bring to a boil, reduce heat, and let simmer until rice is tender (about 45 min), stirring occasionally. Keep an eye on it and add more water if necessary. If making pilaf, wait until the rice is done and most of the water is absorbed, then remove from heat and let sit for 5 min. Serves 3-4. I've been eating ridiculous numbers of sweet potatoes lately, and I don't see myself stopping any time soon. Typically I enjoy them simply rubbed with a tiny bit of oil and salt and roasted until they're tender, caramelized, and practically melt in your mouth. 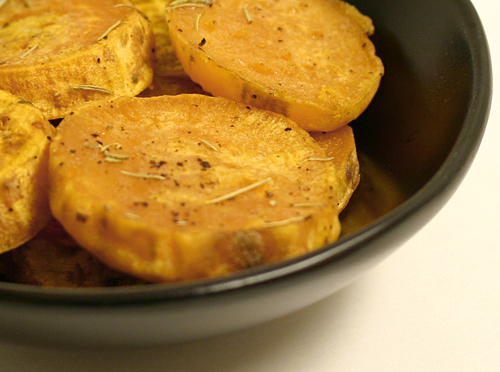 But tonight I decided to try something different - sweet potato slices roasted with garlic and rosemary. This is still a simple side dish, but I loved the combination of flavors and it was nice to mix up my usual routine. 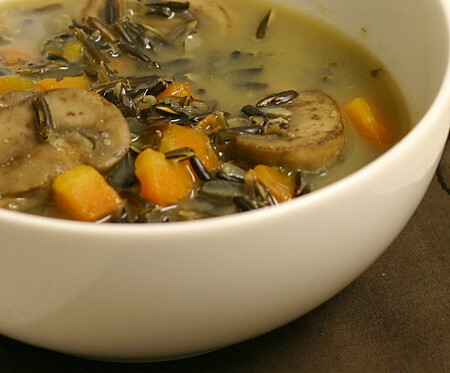 I'm submitting this soup to Weekend Herb Blogging, which is organized by Haalo from Cook (almost) Anything At Least Once, and hosted by Susan from The Well-Seasoned Cook this week. Combine everything in a mixing bowl and toss well. Spread potatoes out on a baking sheet and roast at 425 for about 30 min, turning once. Serves 2-3. Sometimes I'm in the mood to cook something elaborate with complex flavors and new techniques, but most of the time I prefer to use extremely simple ingredients. There's something amazing about putting a few basic foods together and having something fabulous in mere minutes. That's all I could think about when I was making dinner tonight. It took all of 20 minutes (and I was moving slowly), yet it was an extremely satisfying meal. Place the salmon, skin side down, on a baking sheet, spritz with oil, and sprinkle with salt and pepper. Place the baking sheet close to the heating element (about 8" away) and broil for about 10 minutes, until salmon easily flakes. While salmon is cooking, heat 1 Tbsp oil in a large skillet. Add mushrooms and saute until they're tender. Set mushrooms aside, and add garlic to skillet (you may need more oil). A minute later, add spinach and cook just until it wilts. 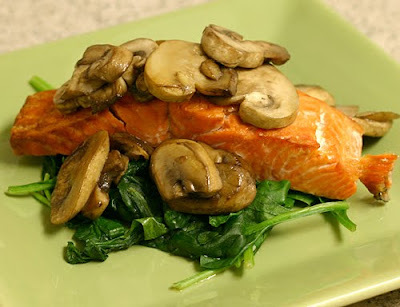 When the salmon is done, remove the skin and place each fillet on a bed of spinach and top with mushrooms. Serves 2.